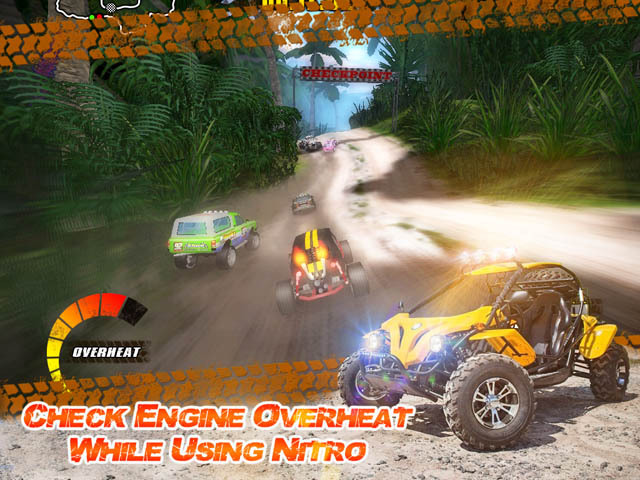 Off-road racing game. A key feature of the Jungle Racers Championship is the participation of different kinds of cars – rally cars, monster trucks, buggies and pickups. All these powerful vehicles can easily overcome complex routes, which are laid among the jungle. Nitro accelerators are installed on all vehicles, and this will help the car of any kind to reach the finish line. There are different types of races in the championship. In the race with time the player needs to get to the finish line as quickly as possible. In the race with opponents the player needs to overtake all rivals, and in the elimination race – try to be the first during the entire race, while the cars going in the end, to be exploded one after another.